WASHINGTON — Researchers have developed an inkjet printing technique that can be used to print optical components such as waveguides. Because the printing approach can also fabricate electronics and microfluidics, it could advance a variety of devices such as optical sensors used for health monitoring and lab-on-a-chip devices that integrate and automate multiple laboratory functions onto a small circuit, or chip. "Inkjet printing is a very attractive method for fabricating optical components because the positions and sizes of features can easily be modified and there is virtually no material waste," said Fabian Lütolf, a member of the research team led by Rolando Ferrini at CSEM in Switzerland. "However, the surface tension of the inks makes it difficult to print lines with a specific height, which is necessary to create a waveguide." Inkjet printing is an additive manufacturing technique that uses tiny nozzles like the ones found in desktop inkjet printers to deposit a computer-generated pattern of drops (the "ink") onto a substrate to build a structure. The researchers discovered that depositing the ink in two steps, rather than the traditional single step, enabled printing of lines with a specific height and with much smoother features than would otherwise be possible. The printed structures are considered to have 2.5 dimensions because although they are not flat, their complexity is limited compared to structures created with traditional 3D printing. In The Optical Society (OSA) journal Optics Express, the researchers show that their technique can be used to print 2.5D optical waveguides and tapers made of acrylic polymer. The printing concept can also be used with other materials such as metallic inks to make electronics or sucrose mixtures for biodegradable applications. Lütolf points out that although printing of electronics is already used commercially, printing microfluidics is more challenging and prone to the same problems as waveguides. "The fact that our approach could allow components with multiple functionalities to be fabricated with a single printer paves the way toward additive manufacturing of entire integrated circuits on chips," said Lütolf. "This means that optical components could be added to flexible hybrid electronics and that optoelectronic components such as light sources or detectors could be integrated into printed optical circuits." Because of surface tension, inks deposited on a substrate tend to bulge or split. Depositing the ink in two steps allowed the researchers to turn the surface tension of the liquid into an advantage. After depositing a series of droplets, the ink printed in the second step seeks to minimize its surface energy by self-aligning between the droplets from the first print. Unlike previous inkjet printing approaches, the researchers did not have to pre-pattern the substrate, which increases the available design space and simplifies fabrication. To carry out the new technique, a series of droplets called pinning caps are first printed. These spherical caps pin liquid bridges formed by the ink from the second print, forming a configuration that immobilizes the ink and prevents the formation of bulges in the printed line. In addition to making straight lines between two dots, the technique can be used to connect three or more junctions to make corners or sharp edges. The new technique offers several advantages over classical photolithography, which is typically used to make tiny components on chips. "Inkjet printing doesn't require a physical mask like photolithography and it is easier to connect components," said Lütolf. "Also, if you just want to quickly test an idea or vary a parameter, additive manufacturing methods such as inkjet printing only require adaption of the digital design." 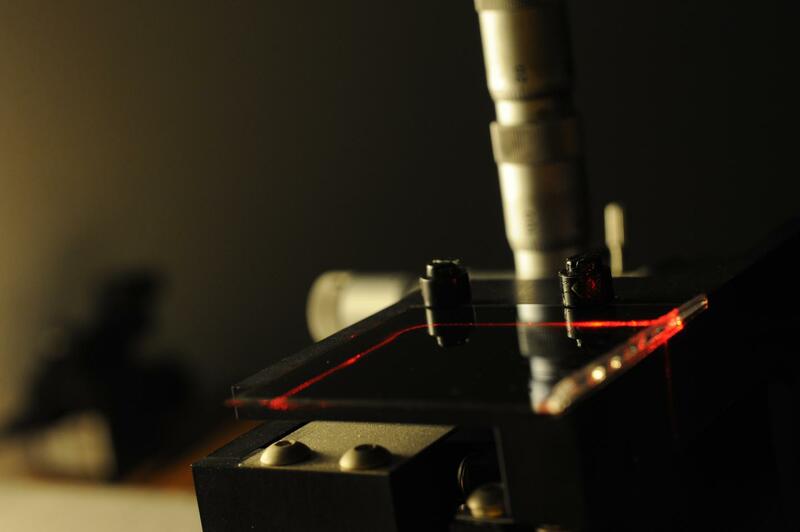 To evaluate the new printing method, the researchers created a polymer waveguide that was 120 microns wide and 31 microns tall with a taper that allowed light from an external laser source to enter the waveguide. They measured the optical loss within the waveguide to be 0.19 dB/cm, only an order of magnitude higher than state of the art waveguides created using photolithography. "In the paper, we report the first inkjet-printed waveguides with loss characterization," said Lütolf. "For the applications we envision, the waveguides would carry light for short distances, and not across entire networks. The current level of losses can be tolerated for such applications." According to the researchers, the smallest possible waveguides consists of a single droplet of ink, the size of which is limited by the nozzle of the inkjet printer. For the printer used in the study, the narrowest waveguides would be in the 40-micron range with a height of around 10 micrometers. Typical industrial inkjet printers also have similar limits. "With our current combination of materials and hardware, it's not possible to make waveguides below 10 micrometers, as typically required for single mode operation. But we are close," said Lütolf. "There is, however, no fundamental physical limit that would prevent us from printing single mode waveguides." He adds that several groups have demonstrated printing capabilities in the submicron range with techniques such as electrohydrodynamic printing (E-jet). It should be possible to combine such instruments with the new inkjet printing technique to create single mode waveguides. The researchers are now working to optimize the printing method and the ink to further lower the amount of light lost by the waveguide. They are also working to make the inkjet process more applicable for large-scale fabrication and, eventually, commercial implementation. Paper: P. M. Theiler, F. Lütolf, R. Ferrini, "Non-contact printing of optical waveguides using capillary bridges," Opt. Express, Volume 26, Issue 10, A520-A540 (2018). DOI: 10.1364/OE.26.00A520.